The rising and falling edge transition time is partially dependent on the set frequency of the waveform. This limits the available rise and fall transitions, especially at low frequencies. The output pulse will be limited by the overall waveform length, which is determined by the number of data points used to create the waveform. This also affects the available duty cycle limits. Waveform data will need to be updated when changing any details of the pulse’s frequency, edge and width. 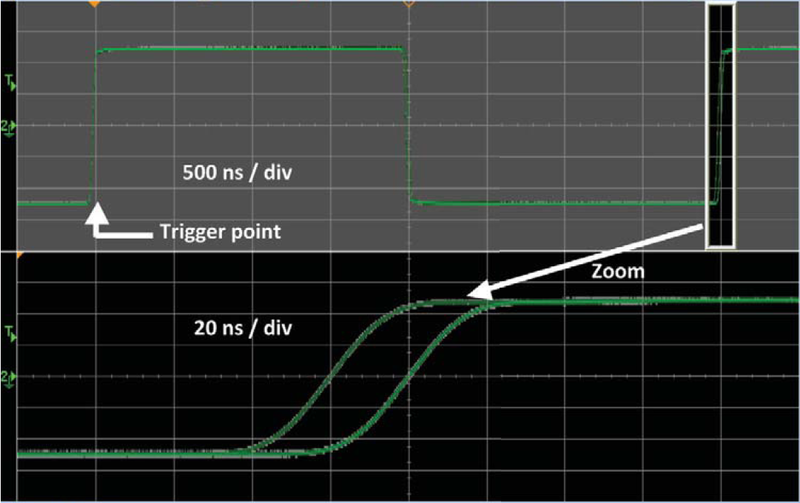 If the waveform length is large, it needs a long time to change the other parameters of the pulse. Edge and pulse width can be adjusted over wide ranges. 1. As indicated in P1, EasyPulse© can keep rapid rising and falling edges (6ns); but the ordinary DDS pulse edge is very slow (in millisecond). 2. 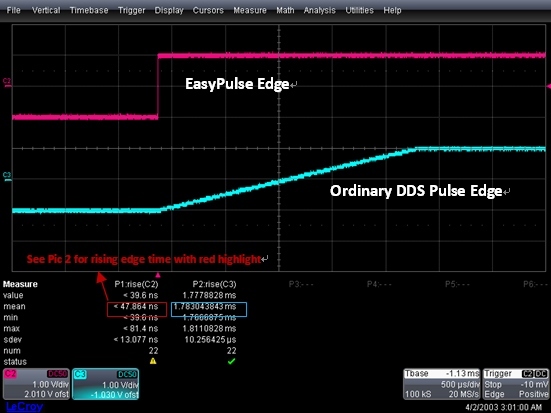 For 1Hz pulse waveform, minimum width of an EasyPulse© generator can be 12ns with small duty ratio (less than 0.0001%). But pulse width of ordinary DDS is large and duty cycle cannot be adjusted to small values. 3. When waveform generator outputs 0.1Hz pulse waveform. 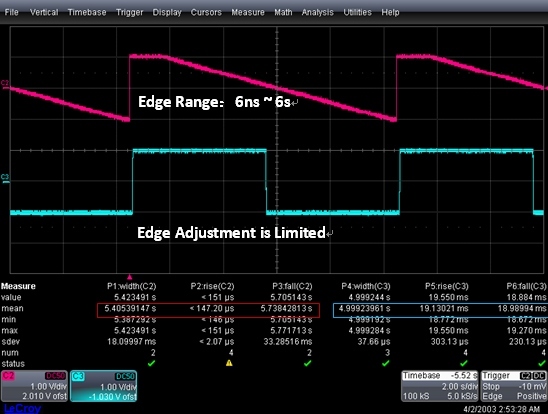 Edge of EasyPulse© can be adjusted over a large range, minimum edge is 6ns, and maximum edge is 6s. However, there is a limitation on the adjustment of the ordinary DDS pulse edge. 4. 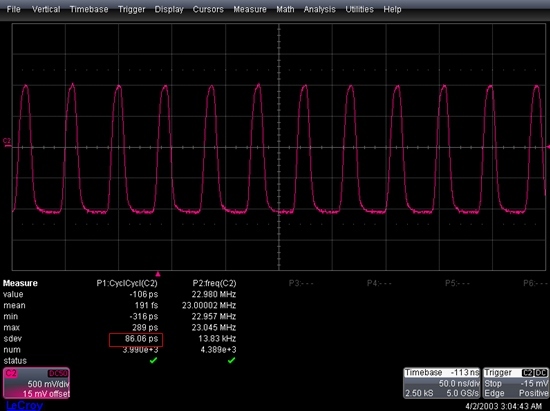 Using A Siglent oscilloscope to measure the cycle to cycle jitter of EasyPulse©, the RMS value (sdev value) is under 100ps. As can be seen from these screen shots, the performance and parameters of EasyPulse© is excellent. Many types of pulse signals can be easily produced. It does not matter whether the frequency is high or very low, the, EasyPulse© performance is maintained. When DDS generates a pulse, if the reference frequency is not exactly the integral multiple of output frequency (i.e. mod(fref/fout )≠0), it will introduce a deterministic jitter equal to one reference clock period, as shown in the figures below.